Our apologies for not doing this sooner but it has been very busy since we returned from your country. We had a wonderful trip with your company and were overall most impressed with the whole booking procedure and the execution of the tour in each city. The hotels and meals were of a high standard, even those where the guides organized and we had to pay. Most of the guides went out of their way to ensure we were well informed and being flexible to cater for our needs. Of course it would have been nicer to have more time in some places. We did get a little tired of the many museums and would have preferred some more local market time. But there are no complaints. Thank you for a most interesting and memorable time in your country. Our very best to you and your guides. A job well done. Firstly, we would like to convey our heartfelt thanks to you and your Organization to give us a memorable trip. Due to some of our emergency nature of works as well as due to some unavoidable circumstances, we could not able to write you in time though it's late however it is a Universal Truth that ' Better Let Than Never'. It may be noted that all the service provided by you were in very much impressive and memorable to us. In question of service of your guides are also very much impressive to us as because the punctuality, smartness, attendance, behavior, friendly attitude of your both young energetic guides, Candy (Beijing), Lily (Xi'an) were very much helpful to us, never we feel we are in aboard. The service and behavior of your drivers were also satisfactory. All accommodation arranged by you were up to the mark. We are very much satisfied your services. 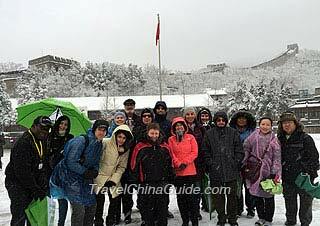 We gathered some knowledge about China through your guides always they were help us in every respect. We will send you some photo graph very shortly which may publish in your website. In near feature we are in impression that we will visit your country with 10-15 heads and all arrangement should be made by your Organization. Your help and valuable advice will be required at that time. It is expected that you and your Organization will be help us. We pay our complements to both of your guides (Lily & Candy) as both of them were exceptionally helpful during tour. Thanks for your email. My mum and I thoroughly enjoyed our holiday and had so much fun. I thought the tour was very well organized and was very satisfied with the hotels and drivers and cleanliness of the buses/transport. The restaurants in all cities provided delicious food and I enjoyed the meals. In Xi'an I particularly enjoyed the dumpling banquet and the lunch in a local family home. Beijing- Sara was our guide for three days and knowledgeable about the sights we visited. Sara was also flexible and her experience of dealing with groups was excellent. Sara was also personable with a fun sense of humor. Xi'an - Celine was our guide while in Xi'an and she was also excellent. Celine took particular care to ensure the group members with dietary restrictions were catered for and no request was a problem. We rode bikes on the city wall and Celine was patient and watched our bags so we could enjoy ourselves. Celine was friendly and welcoming. Shanghai - Joyce was also very personable and professional and provided real life insights into life as a Shanghai local. Overall, the guides I met on my trip were fantastic!! The guides did provide time to complete the feedback forms and were not pushy. Booking the tour was very easy and my emails were responded to quickly. I would recommend to my friends and will definitely look to use Travel China Guide again when I visit other parts of China and India. Thanks for making my holiday so easy. We had an awesome holiday. Every aspect of our holiday was perfectly organized by your company. There was nothing we would have done differently. The guides were superb. The meals we enjoyed have changed my mind forever about Chinese food! I have directed many would be travelers to the your website. Your thoughtfulness in organizing a surprise birthday cake for my husband, complete with candles and serving utensils really touched us deeply. Thank you very much. 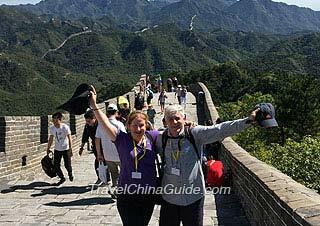 You all deserve the best China tours reviews. We will also write reviews on TripAdvisor. Keep up the good work. We were very pleased with all the arrangement TravelChinaGuide made. Our guide Arthur was excellent and provided us with a lot of very useful information. He was also very knowledgeable. The hotel in Guilin was wonderful. The hotel in Yangshuo was fine, but more tired than the Guilin Bravo. Location of both hotels was ideal. I would definitely use your agency and recommend it to others.